This isn't supposed to happen. Around the holidays your counter is supposed to be filled with tins of cookies and your refrigerator should abound with roasts and braised cabbage and all sorts of homemade goodies both sweet and savory. And then the holidays pass and we clean the house for New Years and after all that indulgence we settle into a January of salads and asceticism. So could someone please explain to me why, in the second week of January, I am so besotted by produce, our kitchen overflowing?? First, my aunt sent us home laden with a caramel cake and a pie and all sorts of commestibles (sorghum molasses! beans! fruit! ), some of which have been relegated to the pantry and the freezer, some of which (ahem, cake) were consumed with alarming alacrity. Second, there is the issue of the crate of ruby red grapefruit my uncle sends every year, don't get me wrong, we love them, but eighteen of them, EIGHTEEN is quite a lot. 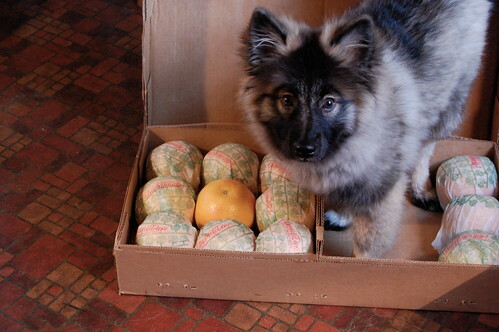 And then, then, only a few days after the grapefruit arrived, a whole box of pears from our neighbor. Did I mention the leftover soup that's packing our freezer from a soup party we had? I'm drowning in the onslaught. The pears have slowly, lackadaisically ripened themselves into possibly the best pears I've ever eaten, but I feel as if I've eaten a gallon of them, sliced alongside my breakfast or in a pear and blue cheese tart. As for the grapefruit: six went to the postman who delivered them, another two into the Christmas salad, a few went to breakfasts, but that still leaves seven grapefruits piled haphazardly on the counter. Since the grapefruits are an annual event I am pretty familiar with just about every grapefruit recipe out there: salads, sorbets, compotes, candied rinds, I even made a grapefruit and Riesling terrine once. But the one thing I usually end up making is pink grapefruit marmalade. This year, as I padded about the kitchen in the quiet dark, slicing grapefruit peels and blanching them twice to remove any bitterness, adding the fruit and sugar to the pot, I did a couple things differently that made this the best marmalade I have ever produced. First, I added a touch too much water to the pot, which meant I had to set the marmalade to a long slow simmer in order to cook it down. It took over an hour in the end, but that long cooking gently caramelized the grapefruit pieces into sweet translucent slices, with only the slightest hint of bitterness. Second, I scraped in the seeds from a vanilla bean, which not only speckled the pink jam with pleasing black flecks but added to the subtly sweet scent. When I say that this is the best marmalade I've ever made, I mean it's the best marmalade I've ever eaten or tasted. The kind of jam you want to eat straight out of the jar, standing by the fridge door, almost like spoonable candy, except with a pleasant hint of bitterness. The only problem is that it uses just three of my grapefruits and produces a rather large amount of marmalade- four jars, which doesn't really help me with the onslaught around here. Not that I'm complaining, mind you. 1. Set a large pot of water to boil. Cut off the peel of the grapefruits, working to get good thick slices, but leaving the inner white pith closest to the fruit still attached to the fruit. Cut the peels into strips. Blanch the peels by submersing them in boiling water for about three minutes. Drain in a colander and rinse under running water. Bring a fresh pot of water to a boil and repeat the blanching process again, this removes any bitterness. Drain and rinse again. 2. Place the peels in a large pot. Cut off all the white pith from the remaining fruits then, working over the pot, cut between the grapefruit membranes so that the fruit sections fall into the pot. Squeeze juice from the membranes and discard them. repeat with remaining fruits. 3. Add the water and sugar to the pot and bring to a boil, stirring to combine. Lower the heat to a very low simmer. Simmer until the marmalade is thick and translucent, about one hour. The marmalade may still appear a touch watery- keep in mind it will thicken as it cools. 4. Add the vanilla bean seeds and simmer another five minutes. Remove from the heat, stir in the rose water (or lemon) and set aside to cool. You could can this and process in a hot water bath or simply store in jars in the fridge. One of my favorite ways to eat grapefruit is to make a salad of sectioned grapefruit, roasted beets cut into wedges, and sprouts, topped with a shallot and red wine vinegarette. The marmalade sounds great...and what a cute puppy! sounds delicious! so there is enough pectin in the grapefruit to assure it will gel? 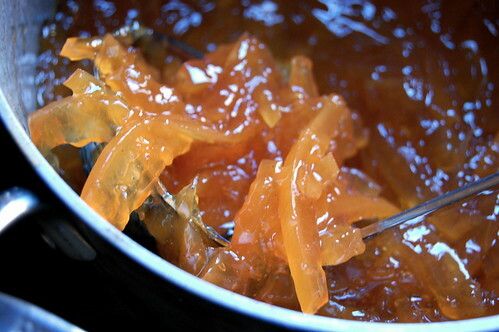 I have had problems getting marmalade to gel, even with additional pectin, but I've never tried a grapefruit marmalade. I think I'll have to try it! DCfoodie- thanks! We've tried lots of grapefruit salads, but haven't tried one with beets yet, I'll haver to add that to my list! Meeso- thank you! The puppy loves getting in boxes, so when this one arrived she was all over it. Quinne- really, I am happy to send marmalade. I already gave one to a friend and another to the neighbor who sent us the pears (the cycle of giving) but we still have tons! Your dog is way too cute. Please tell me he didn't try the grapefruit!?! Goodness, that sounds totally marvelous. I love grapefruit marmelade, but with vanilla? I must go hop to it, now. 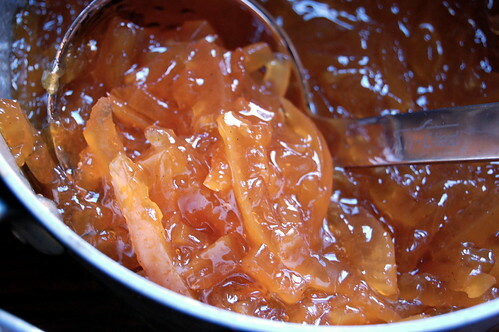 A good idea, grapefruit marmalade. As an Italian immigrant I was raised on white bread and jelly. I wish my mother would have made marmalade. But she worked in a factory in Brooklyn, NY and was never home to cook. Now that I have moved to florida I met a new guy, "Big Bear." Although he is really swell, he is hard to cook for because he weighs 437 pounds and has lost most of his teeth (some kind of drug, I think). I am going to make him some of this marmalade because grapefruit are very cheap here and I know that he will be able to eat the marmalade on white bread (I cut the crust off the bread). I had a similar grapefruit problem (if you can call it a problem), so I made pie. But, I'm making your marmalade. That's a promise. I'm a huge marmalade fan, and this sounds awesome! I want to do some canning over the summer, and this is definitely on the list! I would never think to do this with leftover fruit. It would just sit on my counter and rot. I am so excited about this recipe. I love grapefruit so much, but have never had it in this form. The addition of vanilla is particularly tempting! Thank you for sharing...I can't wait to try it. this sounds lovely. simple, straightforward. thank you. Your puppy has to be the cutest doggie ever!! Sooooo adorable!! Keep up the great work on the blog - I'm browsing through the articles and enjoying the pictures included with each one! Flanboyant- The puppy is more interested in the box, and the grapefruits were individually wrapped, so don't worry she didn't lick or eat any. Luisa- yes, do hop to it! Tammy- I would have called that pie a cheesecake (grapefruit pie sounds not so good), but it looks really lovely! Melissa- yes, marmalade is wonderful, it has that nice bitter/tangy edge to the sweetness. But don't wait until summer, grapefruit's in season now! Alejandra- trust me, I know every use for grapefruit ever ;-) but this is a particularly good one! Shuna- hi! Thanks for stopping by. About the rose oil. In my experience, rose oil is generally not used in Levantine cooking, and is not recommended. True rose water is preferred for it's delicacy- the rose water should be clear and distilled (Aoun brand is a good one). The reason is that imitation rose waters (often dyed pink) and rose extracts can easily be overpowering and harsh. No one wants to eat perfume. Rose oil in the Middle East is widely used as body perfume. However, I don't have as much experience with Moroccan cooking and it sounds like what you got was clearly intended for a culinary use.I'm not sure what to recommend. Have you ever had white coffee? It's just hot water with a little bit of floral water and lemon juice infused in it, maybe you could play around with that idea. Astra- ha, I'm glad someone else has grapefruit problems! Thanks. Walter- thanks, enjoy the browsing! Wow, this looks so great and exotic! When you say it fills four jars, do you mean pint or quart jars? This looks so good... do you think it would work with the waxed grocery store grapefruits? I apologize for my husband, Chuck's behavior. He's posting under the screen name "chiffonade" on hundreds of sites and I see that yours has been victimized. Please pay him no mind. 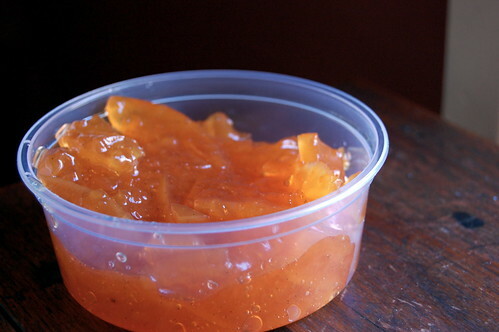 I made this marmalade this weekend using my CSA-provided grapefruits. I added some dried lavender buds to give it a new twist. Delicious. Thanks for offering up the recipe. I'll be posting about it soon! Love the grapefruit marmalade. My first attempt, but not to be my last. Could have used a little more time. Used it in plain yogurt. Thanks for the awesome recipe! It turned out wonderful! It sounds divine....and I LOVE marmalade, especially grapefruit. My mom used to make it all the time and, sadly, mine just isn't as good. i loved the idea of this. but i'm making it as we speak, and i don't feel like the pectin is kicking in. its still very watery :( its been simmering now for like an hour and 15 mins. what did i do wrong? or when it cools will it really gel that much? help! oof! I made this and it WAS perfect but I felt it had to simmer a bit longer in order to thicken. It tasted good, but it just seemed a bit more than a "touch watery." I left it for 12 more minutes and I came back: burned. :( my roommate says it still tastes good, but I am so bummed out. Oh well. I guess all novices have to fail a few times before getting it right. No vanilla beans. Any thoughts on a splash of vanilla? Or maybe almond extract? I put in extract today with no ill effects that I can see. It may not be optimal, but in a pinch, will work. Just tried it out. I simmered mine for about 2 hours and its still looking pretty runny; fingers crossed that it just needs to cool down, but I think I might have to try some kind of powdered pectin salvage in the morning. Could have something to do with the fact that I made a slightly bigger batch. Can't wait to try this recipe! Could you tell me a little more about the yield? All I saw was that it made "four jars." Are those pints? 8-oz jars? Thanks! Wow! This recipe looks incredible! I want to try it out, but have only white grapefruit available. Do you think it would be possible to substitute the variety and still get a tasty marmalade that would set? Thanks a bunch. Tip...use a candy thermometer and boil until you have reach 220F -222F. Perfect consistency! We juiced our fruit then segmented the rind. We scraped the pith from the rind and sliced peels 1/16" thick...omitted the blanching stage and the result...Excellent Seville style marmalade. Finally tried this recipe after having it bookmarked for ever. The marmalade came out so good. I can't believe how tasty it is. Paul's tip (above) is really useful, once the mixture got to 220F it had the perfect consistency. One thing... the vanilla tastes amazing, but if you've got a good vanilla bean and wanted to use it sparingly, you could probably cut back a bit on how much you use. I may try half next time. "Cut off all the white pith from the remaining fruits"
Does this mean you put the pith into the pot? or do you discard it? thanks! I know I'm resurrecting an old post here but I came across this recipe while looking for Christmas gift ideas and it looks great! But... I'm making it right now and it's been simmering on the stove for nearly 2 hours now and it's still very watery. Has anybody else had this problem? Thinking about trying again with less water to start but I'm not sure if that would mess up the ratios too much... would appreciate some insight! Hmmm - Looking back at this, I imagine that my grapefruits were very large, maybe that accounts for the watery issue? I would recommend to just keep simmering, unfortunately it will take longer but eventually the water should cook out. Were you able to salvage the recipe?